With the bookshop where she works about to close, hopeless romantic Laura Horsley, in a moment of uncharacteristic recklessness, finds herself agreeing to help organize a literary festival deep in the heart of the English countryside. But her initial excitement is rapidly followed by a mounting sense of panic when reality sinks in and she realizes just how much work is involved - especially when an innocent mistake leads the festival committee to mistakenly believe that Laura is a personal friend of the author at the top of their wish-list. Laura might have been secretly infatuated with the infamous Dermot Flynn ever since she studied him at university, but travelling to Ireland to persuade the notorious recluse to come out of hiding is another matter. I have never read any title by this author before and this book, together with a few more were given to me by someone who is moving out of town.. 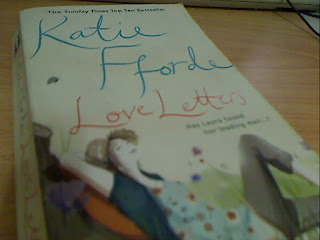 The cover of the book is very casual and very chic lite but story is more towards a romance. I mean what else can the story be with a title like Love Letters, right? Generally Love Letters falls rather flat for me. My interest in this book is more in the character, Laura. Laura is a book lover and quite a literature critic although she is not a writer and neither is she related in the literature world other than working in a bookshop. I find it quite amusing that everyone seems to think the world of Laura just because of that. Other than that, it was just Laura falling in love with Dermot and thinking that she' not good enough for him and how everyone thinks that she's so incredible which leads her to think that she quite incredible too and can be a literature editor and critic and a fabulous literature festival organiser just because she used to organise some book events in the bookshop where she used to work but now jobless because business was bad so the shop has to close the business. I guess you can tell I don't thinking highly of Love Letters. Unless you are the really romantic at heart and don't care much about anything else, I won't recommend it to you and that's just my personal opinion.